If you need to override the default tax rate you can set the percentage under “Override tax rate”. For example of you are charging a tax for the tickets but the session is tax free you can set “Override tax rate” to “0”. If you’d like to allow discount codes you can enable that feature and then select the discount codes that you will accept for this session. 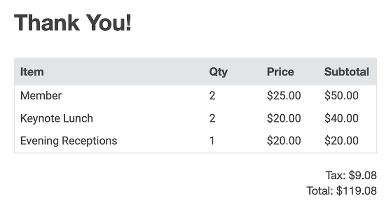 You will see that enabled discount codes will get a blue background after you click on them. Once sessions are created you will be able to choose which ones are available for each “Select a Session or Add-On” question. For example if you are having morning and afternoon breakout sessions you would first create all of the options for both the morning and breakout sessions. Then you would create 2 session questions, one for the morning and the other for the afternoon. You can select which options to make available for each “Select a Session or Add-On” question. 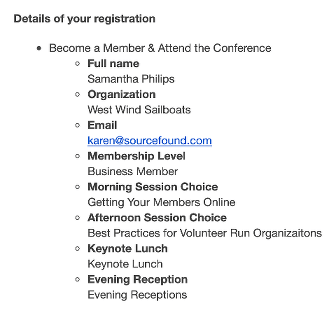 You can repeat the above directions for each session to create a registrant list for each of your breakout sessions. 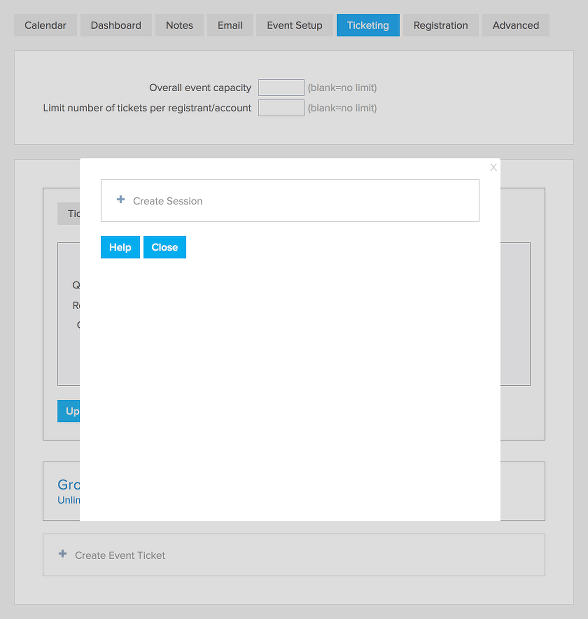 The [itemtable] tag can be used in the event confirmation email to provide a break down of the event registration charges by ticket and sessions. Note that only sessions that have a charge associated with them will appear in the table. 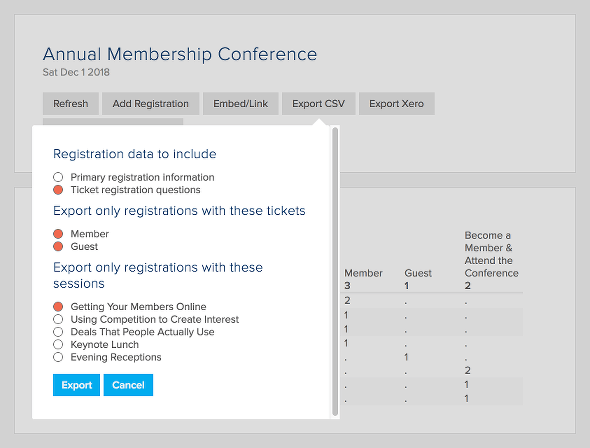 In the example below 2 member tickets were purchased along with 2 keynote lunch sessions and 1 event reception session. To have the email include all the information associated with each ticket, you can add the tag [tqn]. Sessions are set up separately on each event. The discount code is applied to each session included in the registration. For example if you set up a $10 discount code for Session A and someone registers for 3 tickets and chooses Session A for each ticket (ie. total of 3 Session A) the discount code will apply to all 3 Session A for a total discount of $30. Click here to learn how to collect donations with each ticket. Click here to learn how to sell t-shirts and other items with each ticket. Click here to learn how to collect a membership payment with each ticket.